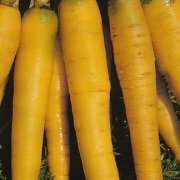 200+ Carrot Seeds- Jaune du Doubs- French Heirloom Variety! Product prices and availability are accurate as of 2019-04-18 21:57:12 PDT and are subject to change. Any price and availability information displayed on http://www.amazon.com/ at the time of purchase will apply to the purchase of this product. This yellow heirloom is one of the oldest carrot varieties available anywhere in the world. Its history dates back to the 14th century french cooking guides and was certainly a European staple for at least 2,000 years. Quite rare. Growing Tip: Make sure your soil is very loose to avoid forked roots. A good sandy mix will always produce a better-looking carrot. 65 Days. 200+ Carrot Seeds- Cosmic Purple!